Πατήστε τη φωτογραφία και δείτε όλες τις φωτογραφίες του Hantang Xinge Hotel Shili Hualang Branch. American Express, Visa, Greatwall, Euro/Mastercard, UnionPay debit card, Diners Club, JCB. Hantang Xinge Hotel (Shili Hualang Branch) welcomes guests with a restaurant and bar. Every room has a flat-screen TV with cable channels. A terrace or balcony are featured in certain rooms. Each room is equipped with a private bathroom. For your comfort, you will find bathrobes, slippers and free toiletries. You will find a 24-hour front desk and shops at the property. You can play billiards at this hotel, and the area is popular for cycling. The hotel also offers free use of bicycles. West Street is 8 km from Hantang Xinge, while Shilihualang is 1.3 km from the property. 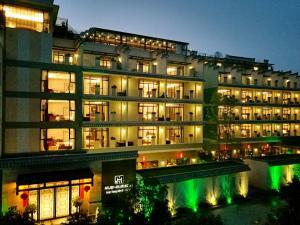 It is 1.5 km from Big Banyan Moon Mountain, 6 km from Yangshuo South Bus Station and 8 km from Impression Liu Sanjie. The nearest aiaport is Guilin Liangjiang International Airport, 697 km from the property.